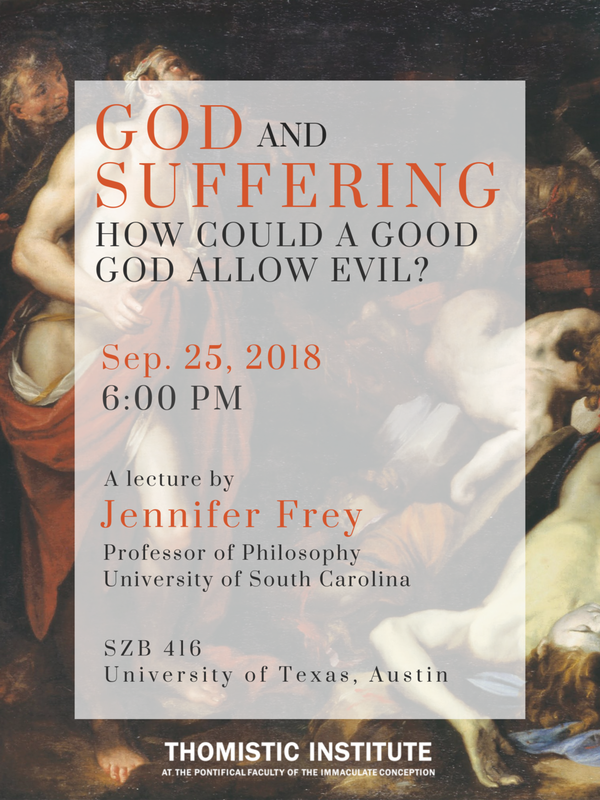 6:00 PM | God and Suffering: How Could a Good God Allow Evil? If God is a wise and loving creator, why would He create beings he not only knows will sin, but also through their sin bring tremendous suffering and evil into the world? In order to begin to think clearly about this question, this talk will explore Aquinas's notion of evil and sin, in order to address ultimate questions about freedom, reason, love, and happiness. Jennifer A. Frey (University of South Carolina) received her BA in from Indiana University in Bloomington Indiana in 2000, and her PhD at the University of Pittsburgh in 2012. In 2013 she was Collegiate Assistant Professor and Harper Schmidt Fellow at the University of Chicago prior to taking up her current appointment as Assistant Professor in the Philosophy department at the University of South Carolina. Jennifer's research interests lie at the intersection of virtue ethics and action theory. She has publications in The Journal of the History of Philosophy, The Journal of Analytic Philosophy, and in several edited volumes. She is the recipient of several grants, including co-a 2.1 million dollar project awarded by the John Templeton Foundation, titled "Virtue, Happiness, and Meaning in Life." She is currently at work on three separate book projects.